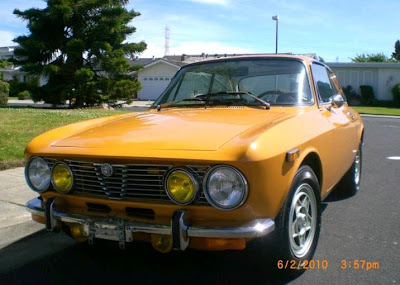 Just A Car Geek: 1974 Alfa Romeo GTV with a Salvage Title. A Bargain? 1974 Alfa Romeo GTV with a Salvage Title. A Bargain? If you know what to look for, a car with a "salvage title" can be a real bargain. This appears to be one of them. 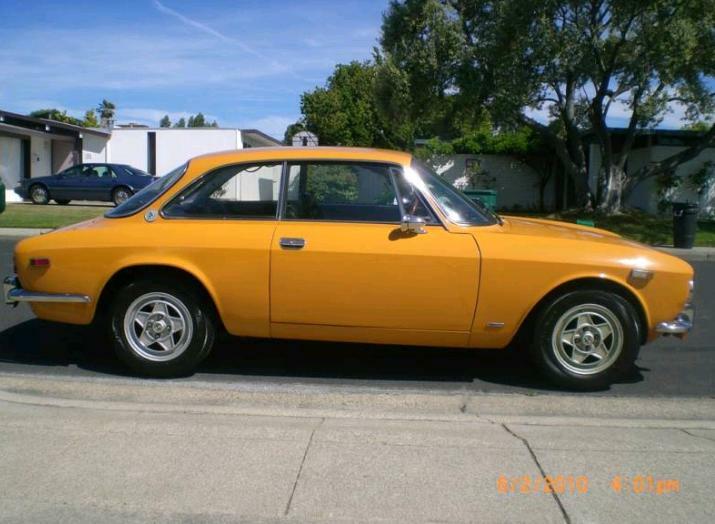 There are very few coupes from the early to mid 1970s that are as much fun to drive as a GTV. 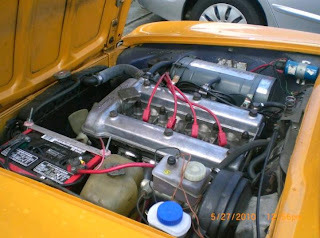 The 2.0 liter, SPICA injected engine sounds great and gets the car to 60 MPH in less than 10 seconds. The suspension, while far from sophisticated, works well and the car handles nicely. The GTV has a 5 speed transmission and 4 wheel disc brakes, features that were not all that common on cars from the 1970s. This is a very nice looking Alfa Romeo GTV. Orange is not a color I normally like on a car, but somehow it works well on the GTV. The body is straight and rust free. The interior is complete. The seller states that the dash cracked but covered by a cap. I assume that the wood veneer is cracked because A) It almost always is, and B) The seller is including new veneer in the sale. After the insurance company totals a car they take possession of it and it receives a salvage title. It is then sold at a salvage auction. In some states, the title will state why it's a salvage title (i.e. accident, recovered theft, flood car, etc. ), in other states it's just branded with an all purpose salvage title. That appears to be the case in this car. In the mid 1990s I bought a 1990 Peugeot 505 with a salvage title for $200.00. It just needed a bumper and tail lights. The car was branded as a total loss due to an accident. I bought used parts and the whole repair cost me $100.00. In Massachusetts, where I live, a repaired salvage car needs to have a thorough state inspection done prior to registering it. If it passes, a new, "rebuilt title" is issued. (Even though the bumper and tail lights were the only parts that were replaced, they checked the whole car. They also wanted receipts for the parts I used, just to make sure I wasn't running some sort of stolen Peugeot ring, I guess. - Remarkably, since I'm notorious for losing things like receipts, I had it. Without it I wouldn't have passed the inspection.) I don't know if that's how it works in other states. The big upside to a salvage title is it devalues the car. 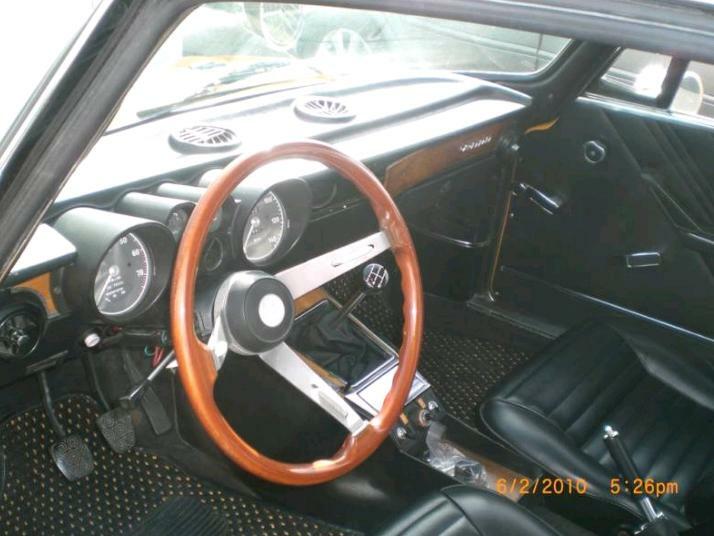 If this GTV is in the condition the seller states it's in, it might go for $10,000.00 or more. This one is available for $8000.00. If you're buying a car to drive and not as an investment, a car with a rebuilt or salvage title can be a real bargain. If you're not sure what to look for when buying a rebuilt car, have someone who is check it out thoroughly. Bad repairs can take a lot of the fun out of car ownership. This 1974 Alfa Romeo GTV is located in South San Francisco, CA. Click here to see the eBay listing. For more info on what to look for when buying a GTV, check out this article on the Keith Martin's Sports Car Market site. This car's been for sale for quite a while - at some point his listing said he just spend $1K on getting a water pump replaced (not a complex repair, it's right on the front of the engine), so I wonder if those repair figures are somewhat high.